In a small skillet, toast the caraway over low heat, stirring, until fragrant, about 2 minutes. Transfer the caraway to a mortar. Add the almonds to the skillet and toast for about 3 minutes, stirring frequently, until golden. Add the sugar and salt to the mortar. Using a pestle, grind the mixture until the caraway is finely crushed. Add the olive oil and grind until blended. Stir in the almonds and lemon zest. In a large bowl, toss the strawberries with three-fourths of the almond mixture; mix well. 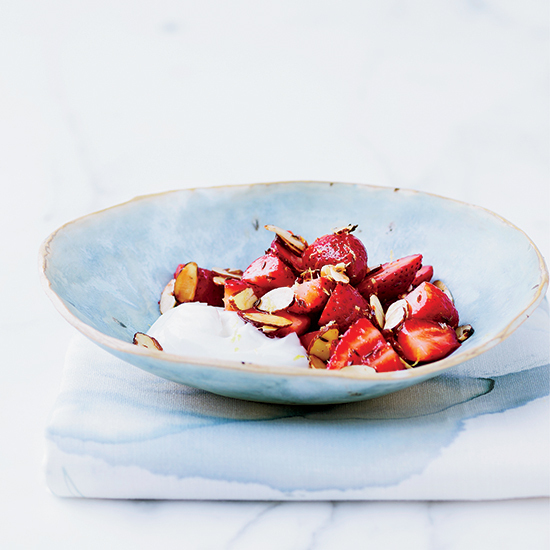 Transfer the strawberries to serving bowls and top with the remaining almond mixture. Serve with yogurt.